Crystal HD® Mouth Mirrors are designed to help prevent eye strain and stress by displaying clear, shadow-free images. This mirror lens is 40% brighter than traditional rhodium with a 99% true-color reflection. Mirrors come in several styles and sizes: #4 and #5 plastic or stainless heads to fit standard handles and one-piece plastic mirrors with Thin Grip or Soft Grip handles. All mirrors are autoclavable. Plastic handles and heads contain antimicrobial protection to aid in preventing bacterial growth. Plastic heads have a flush fit against the lens, eliminating the gap typically found in metal mirrors and preventing collection of debris. 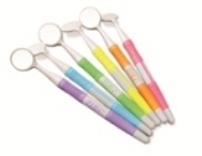 The Crystal HD® #4 Soft Grip Mouth Mirrors evaluated come in a 12 pack of assorted neon colors. 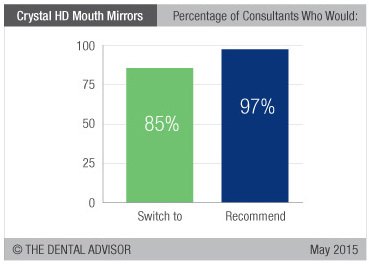 The mouth mirrors were evaluated by 33 consultants in 1097 uses. 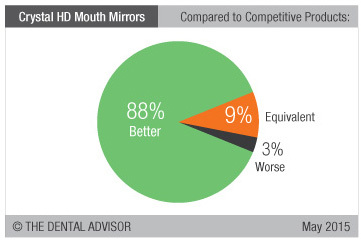 This mouth mirror received a 96% clinical rating. 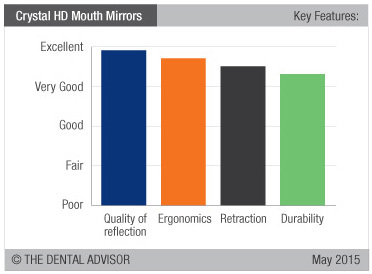 Crystal HD® Mouth Mirrors offer noticeably brighter reflection than standard mirrors. The Soft Grip handle is lightweight and ergonomic, but the grooves can trap prophy paste and other debris. The flush design of the mirror head eliminated trapping of debris in this area. Consultants found the plastic material to be more comfortable for patients. 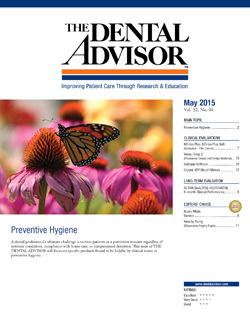 Dental assistants rated Crystal HD® Soft Grip Mouth Mirrors highly for retraction except in cases of very strong tongues, in which case the plastic handle could bend. The colorful handles were a welcome change from standard stainless instruments. Debris on the mirror face is best removed by wiping with a cleaning solution such as the Mirror Magic System.